This very interesting photograph shows two glasshouses and their associated buildings, beside the new railway line from Tokyo to Yokohama. The right-hand chimney is that of the sheet glasshouse, finished 1875. 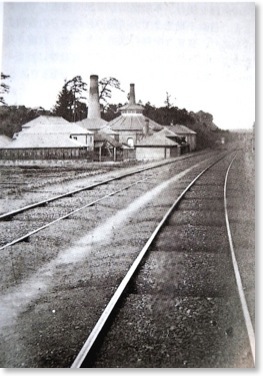 The larger chimney on the left belongs to the flint glasshouse, finished 1877. The sheet glasshouse had a furnace which was rectangular, direct-combustion and set with 6 pots, capacity 240 kg each. The main furnace in the flint glasshouse would have been of the traditional circular shape probably set with 8 pots. Perhaps there were some smaller furnaces beside it but there are no photographs or known records that describe the interior of the flint glasshouse. The sheet glasshouse has an unusual shape, probably designed by the Irish architect-engineer Thomas J. Waters who was involved with the project. Neither circular nor rectangular, the result is impressive. He seems to have taken the cone shape of the traditional English glasshouse (a shape no longer used in Britain at this date) and modified it to suit immature Japanese building skills or to withstand the country’s frequent earthquakes. The flint glasshouse was a much more pragmatic building. See below on the left. It was a design that was common for new glasshouses in Britain at this date. Buildings at the site of the glassworks at Shinagawa, photographed in 1962 before demolition. The left of the two buildings was the flint glasshouse. In 1877 this glasshouse had a chimney which was 24m in height, with a diameter of 6.6m at the base and 2.42m at the top. 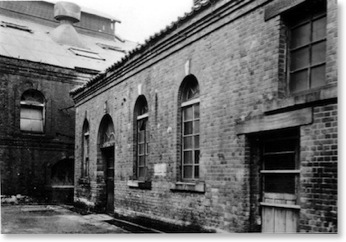 The ventilation on the roof in this photo may be have been added later.The building on the right was probably the glass factory’s laboratory. In the 1960s it was taken down and rebuilt at Meiji Mura Museum, Japan’s open air industrial museum. Reproduced courtesy of the Meijimura Museum. Further details about this factory can bee seen in Sally Haden’s paper published in the Society of Glass Technology’s Journal, 2013.